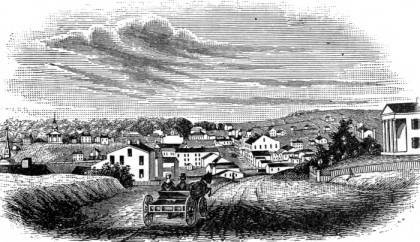 Akron was originally laid out in 1825 and in 1841 became the seat of Summit County. The name came from a Greek word meaning "an elevation" or "point." Originally, the community was located slightly south of its present location, in modern-day South Akron. Many of the town's earliest residents were Irish migrants employed to build the nearby Ohio and Erie Canal. After 1827, when the canal was completed between Akron and Cleveland, the community's business interests really began to prosper. Its location along the canal meant that many farmers brought their crops to Akron to be milled and then transported to other markets, and manufacturing interests such as mills, furnaces, and textiles also emerged. By the second half of the 1800s, railroads connected the community to other important cities in Ohio, and other industries emerged. There were a number of stoneware and cereal manufacturers, as well as a well-known sewer pipe industry. The Barber Match Company, later a branch of the Diamond Match Company, produced one-fifth of all the matches in the United States. The Buckeye Mower and Reaper Company, originally located in Canton, moved to Akron in 1863. Probably among the most famous companies established in Akron were the B.F. Goodrich Company and the Goodyear Tire & Rubber Company, both rubber and tire manufacturers that began to prosper after the advent of the automobile age. In the late 1800s and early 1900s, many migrants from the Appalachian region and European immigrants came to Akron looking for work in these industries. There was also a significant African American population going back prior to the Civil War. In the early twentieth century, Akron continued to grow. During the 1920s, Goodyear branched out into the zeppelin industry, a predecessor to modern-day blimps. The Great Depression hit the city particularly hard, and Akron reported industrial unemployment rates of sixty percent during the 1930s. In spite of the economic problems, the population continued to grow during this decade, possibly because of New Deal programs. The 1920s and 1930s were an interesting time for Akron. During Prohibition, organized crime, illegal alcohol production, and gambling were prominent in some parts of the city, and the Ku Klux Klan had a significant following. In fact, during the 1920s Klan members held many of the important local political positions, from mayor to school board members. Akron's economic problems from the Great Depression ended with the United States' entry into World War II. The need for wartime mobilization meant that factories were once again at full production, and the city grew once again as workers were recruited to make aircraft and other necessary military goods. Following World War II, Akron's residents faced some difficult financial times. The traditional industries that allowed the city to prosper during the 1800s and early 1900s began to decline. As a result of this economic downturn, Akron has experienced a declining population. In 1950, nearly 275,000 resided in Akron. Fifty years later, Akron enjoyed a population of just over 217,000 people. Despite the smaller population, Akron produced numerous famous residents during the twentieth century. Musicians Chrissie Hynde, James Ingram, and Ruby and the Romantics came from Akron, as did actress Melina Kanakaredes and model Angie Everhart. Astronaut Judith Resnik, who died in the Challenger explosion, and Nobel Prize-winning poet Rita Dove both graduated from high schools in Akron. The National Civic League also named Akron an All-American City in 1981 and in 1995.